The Mélange collection by Sybilla is the perfect combination of tradition and modernity, and craft and design and builds a bridge between past and present. The series includes more than 20 rugs, which feature geometric patterns in different colours, representing the modern versions of a traditional kilims. 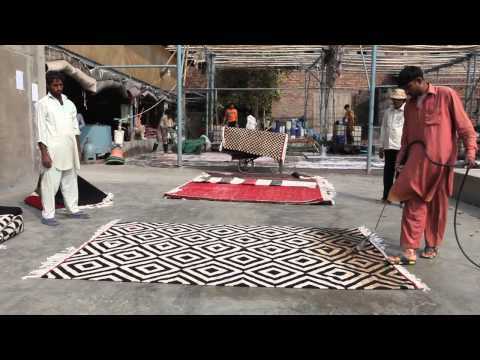 All rugs of the collection are made according to the traditional Pakistani way in elaborate manual work from 100% wool. Originally, the Kilim was produced by African and Asian nomads, to serve as floor covering, wall carpet or tent spread. Today, a carpet that has been woven in traditional Kilim, carries a kind of authenticity and freedom with it. The patchwork effect of the Mélange collection is especially highlighted when the rugs are overlapping, creating a warm and natural atmosphere for a decorative purpose. In addition, graphically matching pouf from the Mélange belong to the rugs collection. This way, they can be placed on the rugs and create a mood like in a nomad tent, where almost everything took place close to the ground. The fashionable Mélange Rugs by nanimarquina stem from the fashion designer Sybilla. Skillfully hand-woven rugs combine modern, graphical design with traditional craftsmanship to a high quality carpet. Sybilla Sybilla is designer and native New Yorker. Her international career started in 1987 with her first fashion show in Milan, where she scored an overwhelming success. The design studio manufactures textiles for the living area.